We build your football club a custom made website for £350 with an annual renewal of £125 (first 12 months is free) which covers; hosting, email addresses and SSL Cert. This package includes setup of one team only. You can add unlimited teams to your website yourself for free or we can set this up for you here. 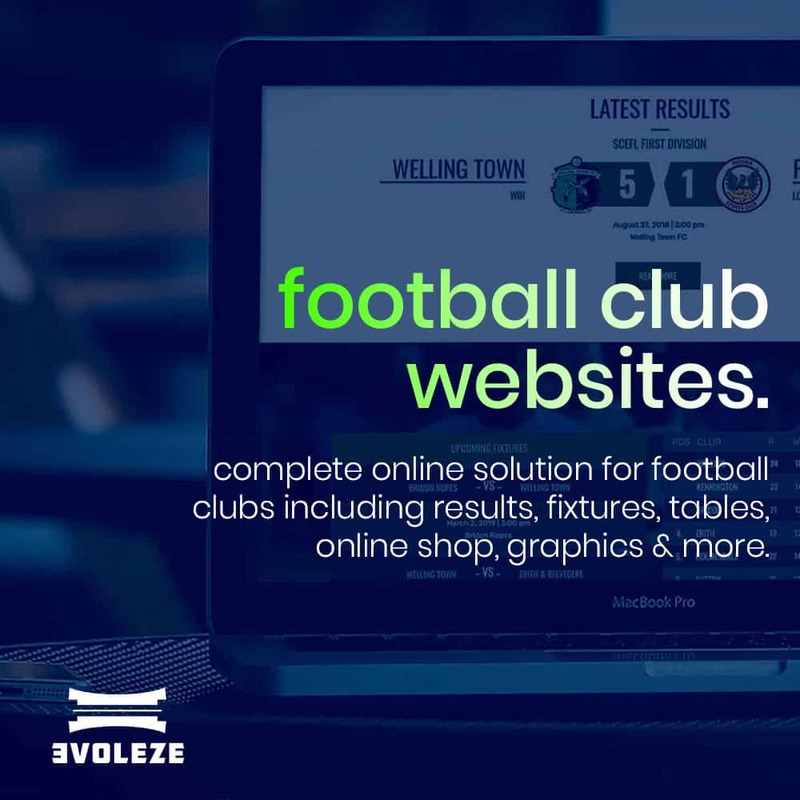 You can update your results, league table and amendments to fixtures yourself with ease, or if you would like us to manage your clubs website completely we can do this here. Upon receiving your order we will contact you to discuss your requirements for your new club website. Your account manager will contact you via phone or email and send you a design brief for you to complete. The average turnaround time is 3-10 working days depending on the size of your website. We completely setup your first teams fixtures, league table, oppositions details (home ground, club logo, club info) and squad for the season. You will have login details to input scores and data for each fixture. We can do this for you after each game if you require here. You can add unlimited teams to your website yourself and provide individual login details to the managers to setup/update their teams. If you require us to setup additional teams we can do it here. We setup your 1st teams full season of fixtures. Fixture info includes, date, time, location (with Google map), starting xi, match preview and previous meetings. Setup of your 1st teams league table including club logos. you can easily manage your league table after each game. Takes moments to do. Every result will be displayed on your teams results page. All previous seasons results will be stored in an archive for view. Apply a match preview to each fixture with a write up with videos and images. After the game has finished you can write a complete match report and automatic player profile stats from each match will be fed into the player profile (below). We will setup your 1st team squad with their own player profile page. This will include a profile picture, player bio, appearances, goals, bookings, red cards, goals and man of the match. This will be updated automatically from your match result. Simply upload your match photos and videos to Fickr and we will feed your albums in to your website. Take secure credit and debit card payments from customers to buy club merchandise such as, match shits, training wear, programmes, season tickets and whatever else you would like to sell. Allow companies to purchase advertising packages through your website. When a company orders you will be emailed which package they ordered, their company info and when it expires. update your supporters with a latest news section. Providing you with a complete match day graphics set to use on social media. We advise that clubs sell sponsorship for the graphics through the website. This usually means our management package pays for itself after 2 games a month. Only available with a management package. 12 months free hosting on our super fast GoDaddy hosting package. We will purchase a .com or .co.uk version of your domain name, eg, yourclub.com, to protect your brand online. Setup of as many email addresses as you need, eg, name@yourclub.com. Accept payment through your website by credit or debit cards for your products or services. This can include, products, variable products, subscriptions, bookings or downloads. We use Woocommerce as our eCommerce platform, which give you a lot of powerful tools including; shipping info, invoicing, sales reports, shipping costs and more. You new website will display perfectly on desktops, laptops, mobile devices and tablets. The first 12 months we provide you with free hosting, emails, backups, security, .com & .co.uk domains and SSL cert. After this 12 months we charge £125 per year to renew these services for a further 12 months. This payment is automatically setup with your order. If you do not wish to carry on with your hosting renewal order you can cancel this before your renewal date. If you are using your own hosting this renewal will be cancelled within 24 hours so you are never charged for it in 12 months time. Terms and conditions apply to this order.